The labor has officially begun! We arrived at the church yesterday morning and went to the work site to meet up with Edwin. For those of you who don’t know, Edwin is the foreman of the church building project. He works full time at the church and the majority of the work done on the church has been done by Edwin. When we take pictures on the work site, we feel like “Where’s Waldo,” only it’s “Where’s Edwin” as he is always somewhere in the background working. His work ethic is remarkable and his heart to get this church built and built well is evident in everything that he does. He is a gift to the Faro Del Cielo church and he is a gift to us each time we visit here. He and his wife, Maribel, are extended members of the Lakeshore family and we love them and cherish their friendship. Edwin was at the work site working already when we arrived. Before we left the U.S., we asked Edwin if there was anything he would like for the work site. He mentioned a couple of things and before we left last week, we went and purchased some of the tools he had told us he would like for the work. We started our day yesterday with giving Edwin his new tools. It was like watching kids open presents on Christmas morning. His smile was infectious and it was so wonderful to get to share in a piece of his joy. Who knew tools could bring so much happiness? After the tools were distributed, Edwin put us to work. He showed us five big patches in the ground about four feet by four feet which he told us needed to be dug out to a depth of one meter. He smiled and said, “It is not bad, only one meter.” We laughed because the first year we came, Edwin showed us similar holes that he wanted dug in the ground and he held up two fingers. The members on the team said, “That’s not too bad. He only wants it two feet deep.” Then they were corrected…not two feet…two meters. That’s a HUGE difference! After digging those holes the first year, the five holes that needed to be one meter deep each didn’t seem so bad! 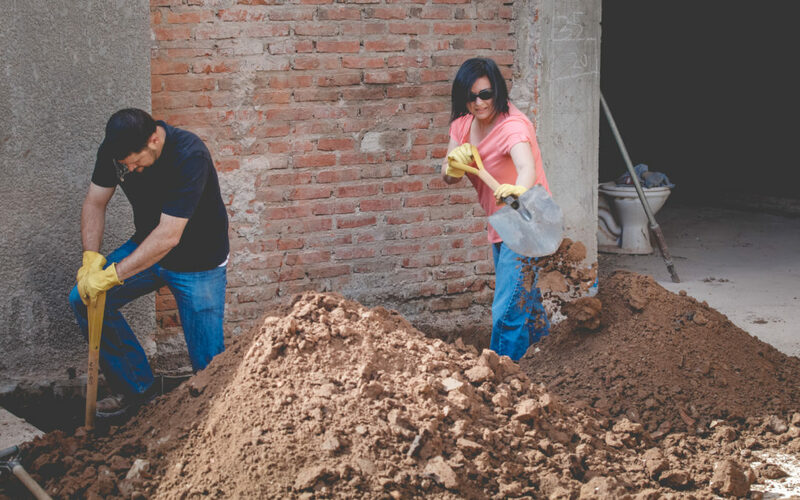 The digging began and Edwin showed us big piles of rubble and dirt that needed to be shoveled and put into wheelbarrows and brought out to the street where someone would come and pick it up and remove it from the church property. We got to work. Edwin had to leave on his bike to go to the store to buy four more shovels. His return trip to the church carrying four shovels on a bike was a site to see! We shoveled and we dug and we shoveled some more. There was one wheelbarrow that had a serious need for some WD40 and we laughed as we could hear the squeaky wheel coming from a mile away. It was hard work but everyone did an amazing job working and we were able to accomplish a great deal. As usual, our day is punctuated with a couple of breaks to the work. Those breaks are necessary as the work is hard and bodies need moments to rest and rehydrate. We build in breaks for the good of all the workers involved. Our first break in the morning is for saltenas. Saltenas are best described as a Bolivian chicken pot pie that you can hold in your hand. They are small pastries filled with a chicken stew and they are sold everywhere here. They are delicious and we share them with all of the people at the church and the Bolivian workers who are working with us. They are the perfect snack. After the saltena break, we go back to work for a couple of hours. A few hours after the morning break, we have a lunch break there at the church. Maribel, Edwin’s wife, is a wonderful cook. She has cooked our meals the last three years and she is a treasure. She makes the most amazing lunches each day and she has them ready and waiting for us as soon as we stop working and wash up. Yesterday she made us a peanut soup, grilled chicken, rice and vegetables. She knows that Pastor Gil loves all things spicy or picante so she makes a super spicy hot sauce to go over everything. My mouth was on fire but Pastor Gil put on four spoonfuls all over his plate and was happy as can be. We had a short team devotional time and prayer after lunch and then got back to work. Dr. Dana and Genelle left the work site to head to the pharmacy to purchase medications for our medical clinics the next days and then to the open market to purchase food for lunches for the week. The pharmacies here do not require prescriptions so we were able to walk in and purchase enough antibiotics and medications for all the people we will be seeing over the next couple of days. It will be such a help to have all of the medicines ready to give out and treat the people over the week. We eventually finished work for the day and went back to the hotel. There were some people walking a little slower after the workday but we got a great start into what we are doing. The church is transformed each time we visit and it’s beautiful. I wish I could transport each one of you there to see it in person, as photos don’t do it justice. It’s a remarkable place, filled with faith and hope and vision. It holds so much potential and you can feel what God is going to do through the lives of people in that place. What a privilege it is to be a part of building what God is going to do here in Bolivia.